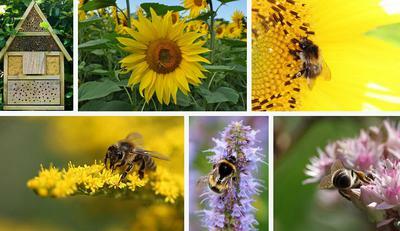 There are OVER 20,000 different species of bees in the world. Bees live in colonies that contain the queen bee, the worker bee and the drone. The worker bee and the queen bee are female, but only the queen bee can reproduce. All drones are male. Worker bees clean the hive, collecting pollen and nectar to feed the colony and they take care of the offspring. The drone’s only repsonsibility is to mate with the queen bee. The queen’s only responsibility is to lay eggs.